Regardless of the style of your sofa, over time, it will get old and acquire little damages. Instead of acquiring a new one, what many of us do is change its covers. A new cover gives it a totally new look while also not breaking the bank. There are thousands of sofa covers in stores, but not all of them are durable and easy to put on. One sofa cover that is unlike many others is the Easy-Going Stretch Slipcover. Below, we list all of its features, advantages, and minor drawbacks to help you decide if this is the one for you. The Easy-Going Stretch Slipcover is a versatile and highly functional sofa cover made with premium-quality materials. Looking at different areas, it is clear to see that it stands out among other sofa covers available today. The Easy-Going Stretch Slipcover is made from high-quality Jacquard fabric, which contains 80% polyester and 20% spandex. It is a little stretchy but is highly durable. It can withstand wear and tear too, which means that it will last for long years of use. This sofa cover has anti-slip foam that prevents it from slipping off of the sofa. It keeps the fabric tight and in place, thus maintaining the presentable look of the sofa. Additionally, it is also built with an elastic bottom, which adds not only more security but also protection to the entire sofa. The Easy-Going Stretch Slipcover protects the sofa from unintended spills, crumbs, and stains. It keeps pet fur and other messes off of the furniture too. The fabric is quite thick, so it is not vulnerable to loose threads and your pet’s little paws. The Jacquard fabric is a premium-quality material that is soft and comfortable to the touch. The fabric feels so good on the skin, giving you a relaxing time when you sit on it. Whether you sit on it, move, or stand up, the cover stays fixed, which means that you don’t have to worry that it might slip off of the sofa. Because of its stretchy quality, the Easy-Going Stretch Slipcover is easy to install. Simply slip it on and align the seams to the sofa. Then, stretch the fabric to fit and pull or push to smooth it out. Lastly, ensure that the anti-slip foams are tucked into the grooves. The flexible bottom will keep the sofa cover in place. Cleaning the Easy-Going Stretch Slipcover is convenient too. It is machine-washable but should be washed using cold water, a mild detergent, and on a gentle cycle. Do not use bleach and high temperature when drying it. The Easy-Going Stretch Slipcover is available in various patterns and colors. Among these colors are dark gray, navy, beige, black, and ivory. Patterns come in purple square, chocolate waffle pique, beige twill, and white squares. The fitting is excellent too. In fact, it can be suitable for different types of sofas that measure 70 to 90 inches long. It can fit in chairs, loveseats, oversized sofas, recliner chairs, and wing chairs. It comes with a measurement guide to secure the fit before buying. 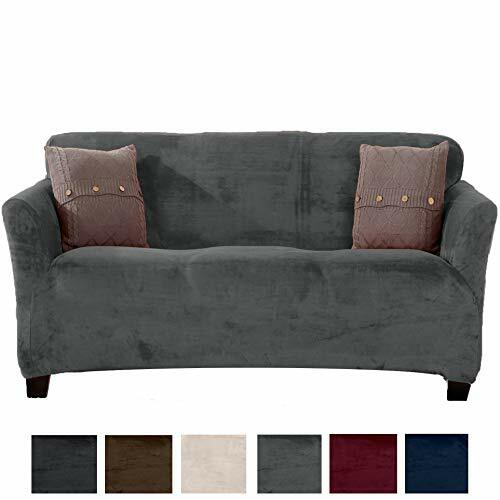 With all of the abovementioned features and reasonable price, the Easy-Going Stretch Slipcover is an excellent sofa cover. However, some users may still be looking for a trendier alternative. Here is a good one: the Great Bay Home Strapless Slipcover. This sofa cover comes in stylish designs, such as dark denim blue snowflake, wild dove grey snowflake, and silver cloud toile. It is also available in solid colors including dark grey, black, red, and walnut brown. The Great Bay Home Strapless Slipcover is made using velvety polyester fabric and an elastic bottom, which secures the entire cover in place. It fits exactly in sofas that are 90 inches wide, loveseats that are 68 inches wide, chairs that are 40 inches wide, and recliners that are 40 inches wide. Similar to the Easy-Going Stretch Slipcover, this sofa cover from Great Bay Home also protects the furniture from spills, dirt, and stains. Compared to the Easy-Going Stretch Slipcover, the Great Bay Home Strapless Slipcover does not have the stretchy quality. While its lush velvet fabric and patterns may be preferred by other users, sad to say, it is more expensive. Sofa covers do not only add aesthetics to the sofa and home interiors but also provide protection and comfort. While there are thousands of sofa covers in stores, not all of them have the durability and comfort that the Easy-Going Stretch Slipcover offers. The Easy-Going Stretch Slipcover is a high-quality sofa cover made with premium materials. 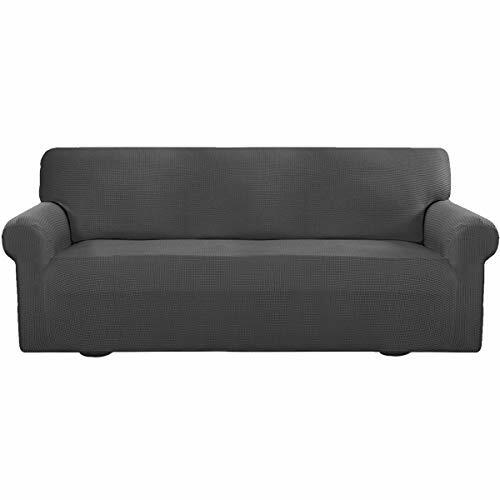 It withstands wear and tear and protects the sofa from dust, dirt, and stains. Because of its stretchy quality, it is easy to fit into the sofa. It is quite thick, but it is easy to wash and dry. Regardless of all the notable features and advantages of the Easy-Going Stretch Slipcover, it still remains one of the most affordable sofa covers in the market. Its quality can match or even surpass expensive sofa covers, making it extremely cost-effective.